*Large Doodle Garden Basket Boxes 10-1/4x6x7-1/2"
Buy More All Occasion Basket Boxes Save More! 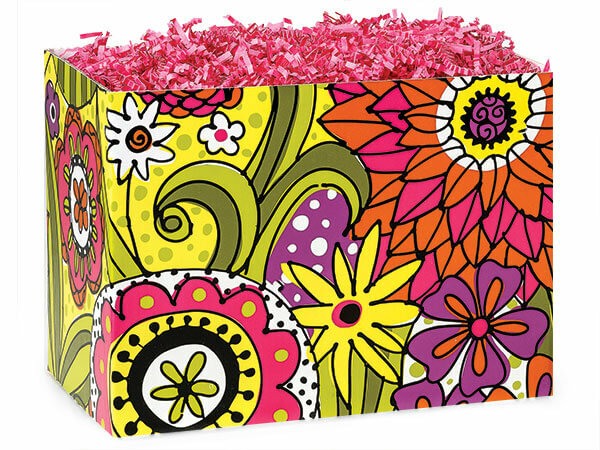 Large Doodle Garden Basket Boxes are a Nashville Wraps exclusive design! All Occasion basket boxes for every occasion! Sturdy reusable themed basket boxes store flat and are a unique and inexpensive alternative to bulky gift baskets. Combine with our shred and basket-sized cello bags for the perfect gift basket. They also make great table centerpieces for parties. We recommend our C2030BC cello bags for Large basket boxes & C14BC cello bags for Small basket boxes. We also recommend GBB2B poly basket bag for the Large basket box and BB300B poly basket bag for the Small basket box.